India's most famous TV host has resigned, sending social media into a frenzy and triggering speculation he may be about to launch his own channel or even join Fox News. Arnab Goswami, 43, quit on Tuesday after 10 years hosting a nightly prime time show on Times Now, the channel where he also served as editor-in-chief. Goswami, whose combative style made him a household name, announced his departure in a staff meeting at the broadcaster's headquarters in Mumbai, a Times Now employee who attended the meeting told CNNMoney. Speaking on condition of anonymity because the information was confidential, the employee said Goswami told about 50 reporters and editors that he wanted to do "something bigger." Times Group, which owns Times Now and the Times of India newspaper, did not respond to a request for comment. Times Now competes with CNNNews18, CNN's India affiliate. Goswami's aggressive approach towards guests on The Newshour — usually shouting them down or shouting over them — saw Times Now shoot to the top of Indian television ratings. India's star host eschewed Twitter (TWTR) and Facebook (FB) but his name was the top trending term on both social media platforms when reports of his resignation began to emerge. His departure prompted a wave of Twitter humor, even as many hailed the furor over his resignation as a testament to his popularity. 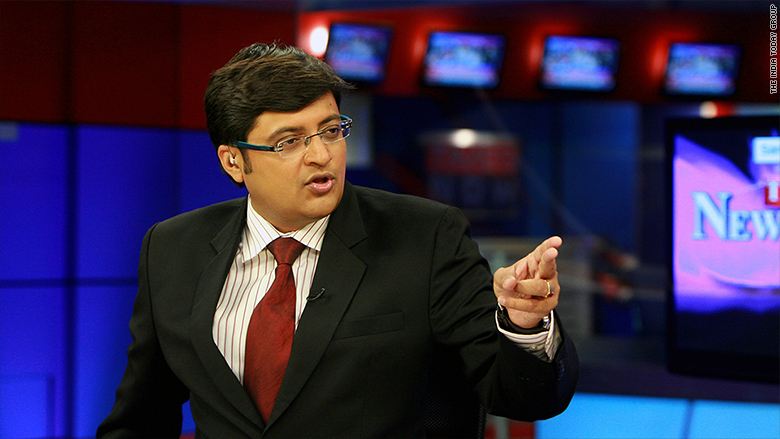 "End of an era with Arnab quitting Times Now. I shall observe one minute noise to mark the occasion," one user wrote. "Impact will be in decibels," quipped another. Times Now must now be desperately searching for panelists who know how to finish a sentence. Alongside the jokes and messages of admiration was plenty of chatter about what Goswami will do next. He has previously hinted at a desire to place India's media on the global stage, saying last year at a conference organized by broadcaster Russia Today that the "hegemony of Western media has to end." 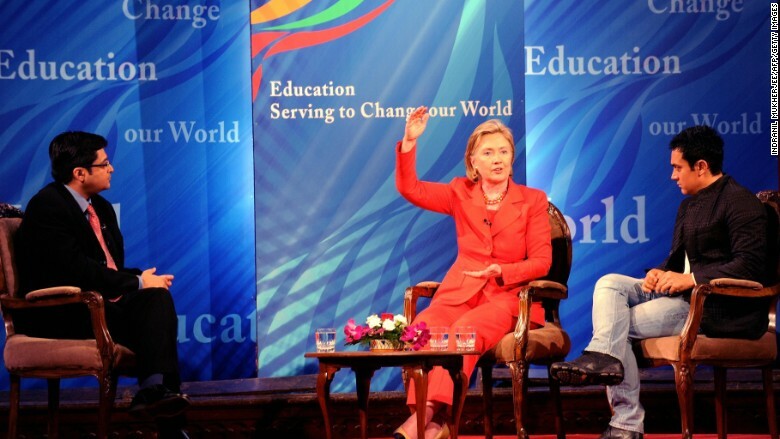 Goswami (left) in conversation with Hillary Clinton and actor Aamir Khan in 2009. Indian newspaper Business Standard cited anonymous sources within Times Now as saying their former boss may start a new channel with an Indian politician and American media baron Rupert Murdoch, or join Fox News. But for now, as Goswami's signature line goes: "The nation wants to know."